A couple of weeks back I attempted to update my couch throw pillows. Easy right? Wrong, complete fail. I planned on simply printing a couple designs on iron transfer paper then ironing them onto some pillow covers. I would keep all my throw pillows and just jazz up the covers. I think my first problem was that I used 10-year-old transfer paper. Second, I didn’t really follow the directions. I have a tendency to move quickly and think “how hard could this be?”. So after a couple botched jobs I gave up. 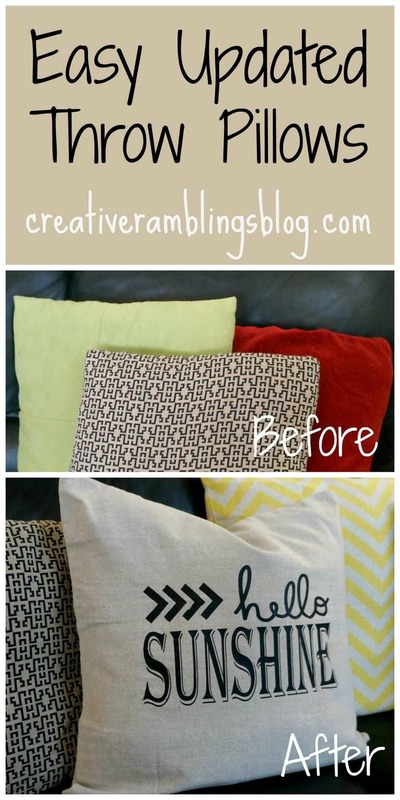 This week I decided to revisit those pillows and it turned out marvelously! 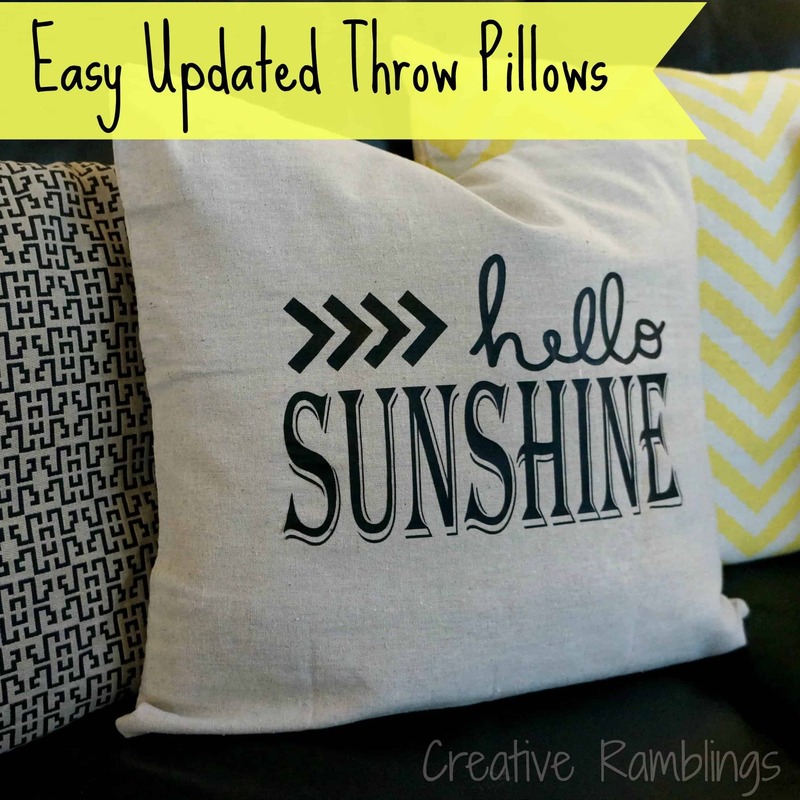 Take a look at these easy updated throw pillows. Replacing pillows can be expensive, but mine were in need of an overhaul. My last living room had touches of green white and gray so the green pillows looked great. In my new living room I have no green and the pillows have taken on some toddler art work. The black and cream pillows are in good shape, I’ve had them for years. The red pillows started as something I pulled out at Christmas but they are so comfy that the family wouldn’t let me put them away. Trying to save a little money and be creative I started searching for pillow covers. I stumbled upon the jackpot at Hobby Lobby. I don’t have one too near me but at $5 a pop I am happy to pay the shipping. I bought 2 yellow and cream chevron covers and 2 linen covers. I decided to keep the black and cream pillows as it, I really do like them. This time around I used my Silhouette to cut a design onto heat transfer vinyl them iron it onto my pillow cover. I love how these all look together, different patterns and textures while still keeping the comfy pillows my family loves. A couple of tips from a Silhouette newbie. I read the instructions and watched a video on the heat transfer material. I find the Silhouette videos very helpful, I am definitely a visual person. However, I couldn’t get the material to stick! I finally figured out…. 1) Press really hard for 60 seconds on each piece of the design without moving the iron. 2) Let the plastic backing cool completely before pulling it off. It stuck on there pretty good and I was a little afraid to pull it off, but it came off with most of the design stuck to the pillow cover. 3) Put a thin cloth back over the design and iron for a few more seconds. 4) Finally iron it inside out for a minute to finish adhering the design. My whole living room feels bright and cheery, a few pillows really make a big difference. What little changes have you made to liven up a room? « What I Love Wednesday – Craftsy! Thanks for stopping over, glad the tips are helpful. It’s a fun product to use. Lovely cushions, I too now wish I had a vinyl cutter! Where did you purchase the transfer? I bought the same yellow chevron at HobLob – got them for 50% off. Quite a deal. I didn’t see any of the linen ones though. Visiting from C.R.A.F.T. I purchased the transfer material at Michael’s, they have 2-3 colors in store. You can also get it at the Silhouette online store. 50% on the covers, awesome deal! Thanks for visiting! These turned out great! I have a silhouette too and LOVE it!! Thanks for sharing! I love the “hello” pillow! I’ll have to give this a try….especially since the pillow covers are 50% off this week at HL. Thanks for sharing. What a deal! Thanks for stopping by. Really cute design! I love your choice of fonts. Also all the pillow colors and patterns work together beautifully! I just got a silhouette as well, I’m in love with my new toy… way too much fun. Thanks Kristy, have fun with it! 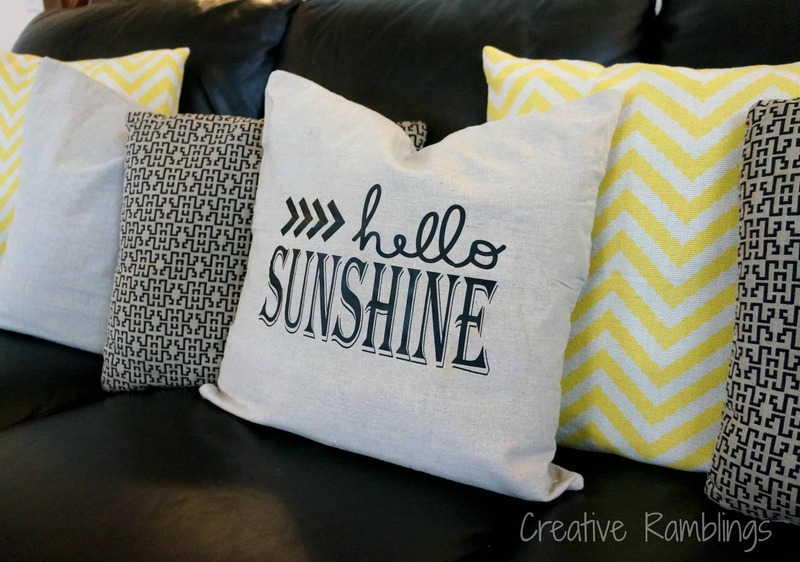 Love the way you up cycled your pillows and used your cameo to create your transfer! Love the fonts you used. Thanks Antonella, glad you stopped by. I love printables, I will have to check out your posts. Love the pillow! Great way to reuse something old! Turned out great! Thanks Mellisa, it’s now one of my favorite items in my living room. Sarah! 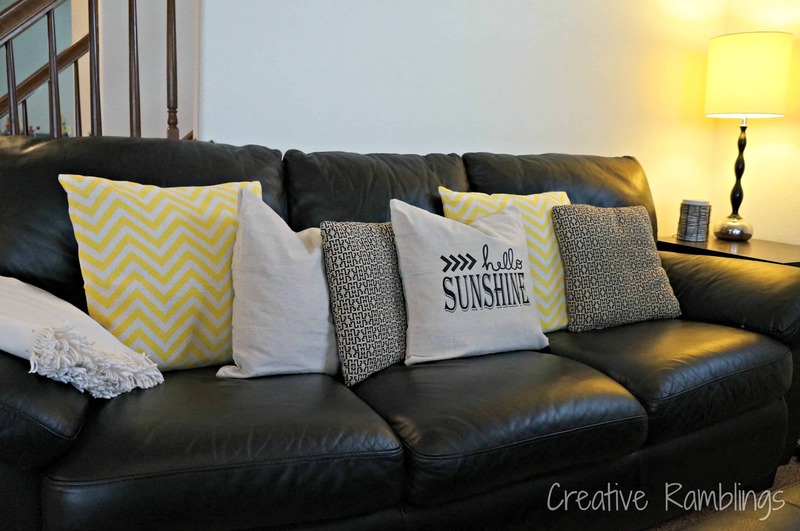 I love this adorable pillow – and with the yellow chevron the whole thing does feel so cheery and fun!! Right up my alley! I seriously need a silhouette- you can do that???? wow! Early Christmas present for me maybe?? Lol – pinning this super cute idea!! Totally treat yourself Christmas is right around the corner 🙂 Love all the fun stuff this machine can do! I love the pillow and all the other pillows to. I mite have to make some for my couch. Thanks Kayla, just entered your giveaway cute towels. These are super fun! You are one of my picks for features this week at Give Me The Goods! Yay!! I waited on mine for a while, not all those pent up ideas are pouring out! Thanks for stopping by. Oh the joys of a young pet, at least they are cute! Thanks, as always, for stopping by. Hi Marilyn, I just pulled up that design in my Silhouette software. Unfortunately, I created this on an old computer and when I pulled it up on this one the font was not recognized. I must have purchased or downloaded it a while ago and never transferred the files. Sorry I can’t be of more help. I tried whatthefont.com which can usually help identify a font, the closest I found was Bordeaux Display. Hi,I read your new stuff named “YouTube” regularly.Your humoristic style is witty, keep it up! And you can look our website about proxy list daily.